At a packed meeting at lunchtime on Friday 17th February, in Transport House, Belfast, striking postal workers decided to end their wildcat strike and return to work having won their dispute. An independent review of industrial relations, the key demand of the strikers, has been won. Strikers also forced Royal Mail to agree a non-victimisation clause in the agreement that brought the dispute to a close - while the 12 month no strike clause was effectively scrapped. 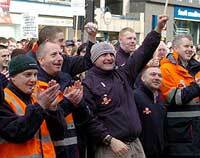 The eighteen day dispute an inspiring victory for postal workers and all workers across these islands. Posties taking unofficial action against a bullying and vindicitve management were up against NIC-ICTU bureaucrats who bad-mouthed them for taking unofficial action, against a hostile media that deliberately obscured the reasons for the dispute, a rival union that slandered the strikers and encouraged scabbing and the full range of the Thatcherite anti-union legislation that is unheld by New Labour. Wildcat action, solidarity, imagination and the building of effective broader support combined with the determination and spirit of these workers has won an important victory. Not just for the posties but for all of us. And thats no exaggeration.